When authentic shipwreck coinage retains its original surface character or shows no visual evidence of immersion in water, it is graded using the NGC Coin Grading Scale, a 70-point numerical scale. Because of gold's inertness, in many cases, properly conserved gold coins show no effect of prolonged submersion in saltwater, allowing them to grade without any specific mention of the shipwreck effect. Although exceptionally high surface quality can be seen on some shipwreck recovered silver coins, silver more frequently does retain signs of exposure to saltwater regardless of the conservation methods used. 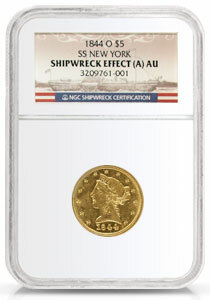 Because some recovered coins will show this shipwreck effect, NGC has adopted a grading convention to certify and authenticate shipwreck coinage. This is the SHIPWRECK EFFECT designation, and it allows NGC to accurately describe the condition of a coin by noting surface disturbance that results from its preservation history. Not all shipwreck artifacts are handled similarly. To earn this designation from NGC, several conditions must be met. The coins must be recovered in an archaeologically sound manner, in accordance with tested and proven procedures, to preserve the history of the wreck. Furthermore, the coins must be conserved by the least invasive means possible to ensure stability of the artifact surface and long-term preservation. SHIPWRECK EFFECT A — a coin exhibiting minimal surface disturbance from saltwater exposure, and exhibiting superior eye appeal for a shipwreck artifact. SHIPWRECK EFFECT B — a coin showing evidence of light surface disturbance from immersion in saltwater, and may have some areas of moderate disturbance, not affecting central design elements. Coin possesses above-average eye appeal for shipwreck recovery coin. SHIPWRECK EFFECT C — a coin displaying moderate disturbance to its surface from exposure to saltwater, while possessing at least average eye appeal for a recovery specimen. Accurate attribution and identification is not hindered by any surface impairment. SHIPWRECK EFFECT — portions of the coin exhibit heavy to severe disturbance from saltwater exposure, with metal loss affecting the design. While accurate identification and attribution may be possible, it is no longer possible to draw conclusive determinations about the coin’s surface prior to saltwater exposure. NGC Shipwreck Certification uses the term GENUINE to describe authentic shipwreck coins and artifacts with confirmed and documented origins. Recovered artifacts may be identified by attestation from the individuals who discovered the wreck, an independent archeological survey or other means. The assigned pedigree and authenticity of the wreck are subsequently confirmed independently by NGC experts. While often available, additional archaeological evidence is not necessary to support this designation. In addition to categorizing the level of surface disturbance, NGC assigns a wear or details grade to coins designated SHIPWRECK EFFECT C or better. This convention attempts to describe the state of wear of the coin prior to shipwreck and saltwater exposure. UNC (Uncirculated) — a coin showing no wear or evidence of having circulated. AU (About Uncirculated) — traces of light wear are evident on the high points of the coin’s design. XF (Extremely Fine) — design features are well defined although light wear is evident throughout. VF (Very Fine) — major details of the coin are clear although light wear is evident; the high points show moderate wear. F (Fine) — moderate wear or many elements with heavy wear on high points. The major design elements remain visible. VG (Very Good) — heavy wear flattens design elements, although major features are clearly outlined. G (Good) — design details are flat and visible in outline. Some portions of the design may be faint.